The Dallas Mavericks have earned themselves a visit to the White House on Monday, as each of the 2011 champions will be awarded a meeting with President Barack Obama, along with new editions to the 2011-12 Mavs outfit. 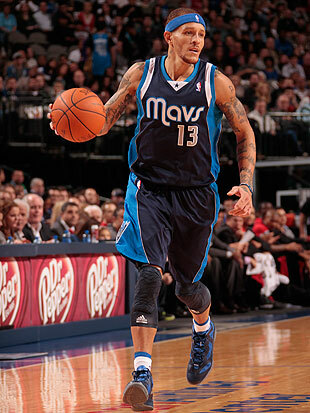 All save for one Maverick, oft-troubled off guard Delonte West. West, who had a high profile arrest over two years ago while under the influence of prescribed medication, is "banned" (to use his words) from stepping foot in the White House after the president's security team ran a routine background check on the guard. "I'm banned from going to the White House, so I'm not going to make it,'' West said after tonight's 96-81 win over the New Orleans Hornets. "But I'm going home to D.C., I'm just not allowed to go to the White House. "I've been there 100 times in my lifetime,'' said West, who was born in D.C. "I live right around the corner. The oddly worded admission came on what appeared to be a seemingly rough night for West, who later went on a Twitter rant following his session with Dallas reporters. The profane tweets, since deleted, can be found here. Why West targeted former Akron Beacon Journal Cavaliers beat writer Brian Windhorst (someone that covered West, seemingly without incident, for two years), who now writes for ESPN and wasn't at the Mavericks' game on Saturday, is beyond me. As has been the case since he entered the NBA in 2004, West remains a talented starting-caliber guard who certainly can put a very good team -- like the Mavs -- over the top. But even while medicated his moods tend to swing, and being constantly reminded of his previous mistakes certainly isn't helping much. Journalists can't be asked to back off, though. Especially when he'll conspicuously be the lone Maverick left off the bus ride to 1600 Pennsylvania Avenue on Monday. I will now back off and let what will almost certainly become the strangest comment sections in the history of the Internet take over from here.